Bossy Italian Wife : Quick Fix: Orange Vinegar Cleaner! I really love Pinterest, and I am not ashamed to say that I spend time cruising the pin boards for everything from fancy pants nail designs to fashion ideas to crafts and food. 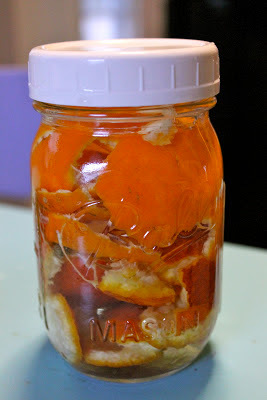 So one day I was doing my daily sweep and I found THIS great idea--using oranges and vinegar to make a cleaning solution!!! So, basically, you peel two oranges, eat the inside and place the peels into a pint jar. (Good way to use something you might normally throw out, too!) I used one blood orange and one regular orange. You put the rinds into the jar and then fill it with white vinegar. Then you simply put a cap on it and let it sit for two days. I have these really awesome plastic lids I bought at Southern States that are made for my Ball jars. I love them! But you can use the traditional lids that come with the jars as well. So then, you pour your vinegar into a spray bottle and you use it as you would any other all purpose cleaner. I'm using it to clean my counter tops! Really neat and easy right?!?!? And just so you guys know--this smells amazing. It doesn't smell all harsh or like chemicals. What type of cleaning products do you use in your home? Are you totally natural or do you stray to the chemical side? I have to say, I am guilty of sometimes using bleach....It makes me feel secure. Share in the comments section below! Love this idea. I going to give it a try. I clean a lot with baking soda. It is a good abrasive.